Class of 2023, Devin Sanford from the great state of Michigan is a new face player who’s making a name even before he touches the AAU hardwood. He rarely plays on the national circuit, and he doesn’t have a mix-tape, yet. However, he is still one of America’s best ten-year-old student athletes that most people haven’t heard of until now. Sanford is one of the best finishers in traffic as his perimeter game is nearly second to none. He is a serious threat on offense from both inside & outside, and he plays efficient defense. After last year’s MSE Michigan Camp, we wrote that “Devin Sanford has good size and he can score at will.” And Sanford, who’s currently ranked No.31 nationally, according to Middle School Elite, could witness his stock rise among peers, coaches and scouts in the coming future. 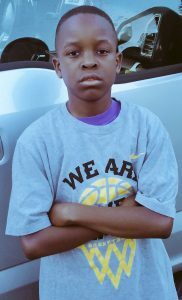 Saveon Robinson 5″10′ travel team sc hornets sc. 2020 RANKINGS 1.CHRIS JACKKSON 2.ROGER SMITH 3.SHAQ FORD 4.JALEN ROBINSON 5.DEENTAE.B 6.SAVEON ROBINSON 7.SHANOON JOHSON 8. AHAAD.G 9. LAQUETON GRAM 10. JAKE S.